Speckles, aka Texlan Speckles, is a 1¾-year-old white-ticked female, born May 26, 2001. 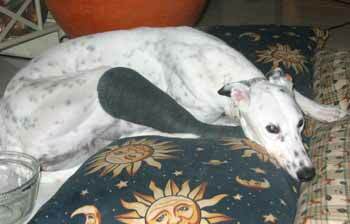 Speckles comes to GALT as the result of a fractured right rear leg with severe torn ligaments, which occurred as she turned the corner at the Harlingen track headed for the home stretch Sunday, February 9. 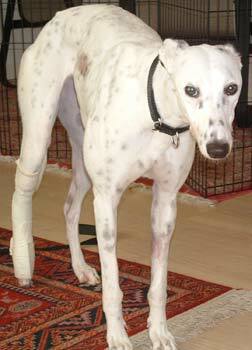 GALT's volunteer in Harlingen was contacted, as Speckles was in jeopardy with this injury. 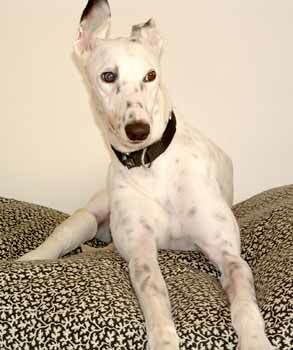 She and Jo ODonnell, GALT volunteer in Austin, then coordinated Speckles' transportation to Dr. Mike Herron in College Station. Dr. Herron has been a Professor in Orthopedics at Texas A&M University College of Veterinary Medicine since 1979. His expertise in orthopedic procedures is recognized throughout the world due to his involvement in Greyhound and Canine Performance Sports Medicine. 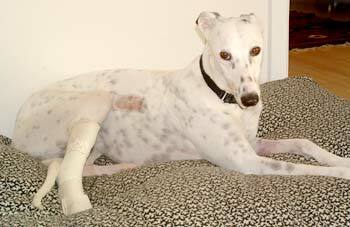 Dr. Herron set Speckles leg with two pins and a cast on Thursday, February 13, and it will be an estimated six week recuperation period. Speckles disposition is loving and very affectionate. She gets along well with other dogs, large and small. Speckles cast was taken off as instructed; however, she would not put any weight at all on the leg and her foot was curled under which of course indicates her healing is not at all complete. She goes back in on 4/16 to have the leg re-pinned with another 8 to 10 weeks at least ahead of her. Speckles' surgery went well and she is now carrying around an external fixator; so far so good, but she still has about 6-8 weeks to go. Her foster mom is keeping her as quiet as possible. 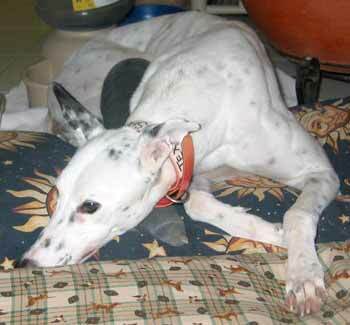 Speckles is such a special girl that her foster mom, Carol, has decided that she is already in her "forever" home. 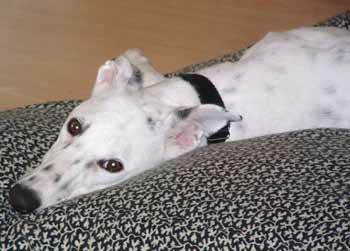 Speckles, now "Lindsay", has officially been adopted and is in her forever family joining 3-year-old Lance. She is tolerating the external fixitor very well, and it will come off in about 3 or 4 weeks. It has been a long road of recovery for her, and it is almost over - what a wonderful ending for everyone - especially Lindsay!